“For my final year project, I’m creating a food token game aimed at children who struggle to eat healthily. The inspiration for the game came from summer work at my mother’s nursery. I could see first-hand exactly what parents packed their children for lunch and snacks during the day and every day I saw that most of the food was unhealthy, processed and of little nutritional value. All the food had a very common theme though – it was all very quick and easy to just put in a lunch box, and the kids just loved it! 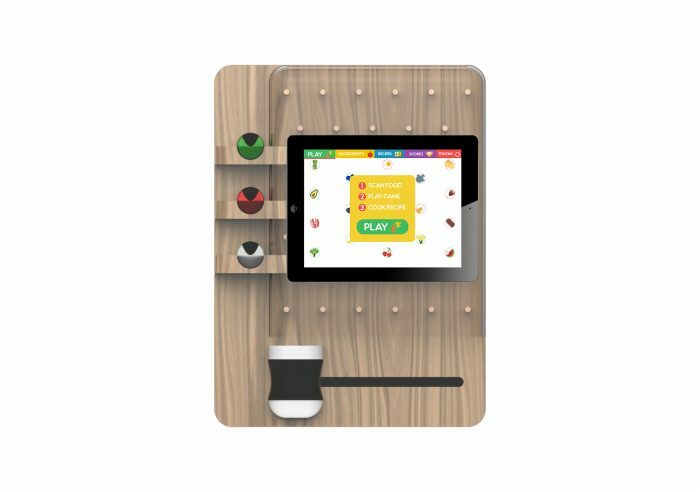 With my game, each day the children would get eight ingredient tokens to put through the game, without knowing which ingredient corresponds to each token. The tokens are divided into fruit and veg, carbohydrates and protein. Once each token is caught in the cup at the bottom of the game, the ingredient they have unlocked will appear on the screen via the app. As and when the children unlock all eight ingredients from the game, three different healthy and easy recipes will appear for the children to prepare and cook with their parents. “I’m hoping to find potential investors to help me take my project further into the ‘healthy eating’ market, but if that isn’t possible, I’d love to have a product or graphic design job in London or Brighton, where I could evolve my design skills and knowledge and put myself on the design ladder! Can you tell us about your time on the Product Design course? This entry was posted in Design and craft, Graduate Show, Graduates 2017, Product design, Undergraduate and tagged Children's food, Food, Gaming, Grace Florence King, Nutrition, product design.